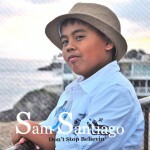 Sam debuted his first CD which includes four songs with one being an original on August 4th, 2012. The CD also contains all four backing tracks which Sam invites you to use in your own performances! Sam will donate 100% of all proceeds received from all his music downloads until the end of this year to help the people of the Philippines to put back their lives after the devastating flood and recent earthquake. CD includes an insert with a brief biography, lyrics for Sam’s original song “You’ll always be”, credits and artwork. For a FREE AUTOGRAPHED COPY please use second order button. (Please understand that the autographed copy will arrive without plastic seal.) Be sure to tell us how you want the CD addressed in the message option on PayPal!